The combination lock is dying the death of the dinosaurs when it comes to making the gun safes foolproof against criminals getting unauthorized access to the contents of the safe. The need for gun safety and the rising rates of crimes across the states have contributed to the common man rethinking the ways he/she could keep the firearm safe. The ability of the residents to respond quickly in case of a home invasion, protection against theft and for personal protection is changing the way people are looking at the modern and technologically advanced gun safes. The fingerprint or biometric recognizing gun safes are the ones that offer state of the art technology and enhanced safety to both the owner and firearm respectively. The market is flooded with a plethora of options for gun safes that offer biometric security to the user that is available in various shapes and sizes. These cater to the different types of weapons such as the long guns as well as the sidearms. Depending on the level of technology and the quality of materials used for manufacturing the gun safe, the cost of the same could vary and compel you to revise your budget. The first question that can pop in the mind of a prospective buyer is why choose a biometric enabled gun safe over the mechanical combination lock. The answer to that question is the security factor that is offered by the safe. Since the safe can only be accessed by you or the person who has enrolled his/her finger print in the system, therefore access to the firearms within by your kids or by any unauthorized person is practically impossible. In the case of an emergency situation, access to the firearm will be much easier compared to that of a traditional safe with combination lock mechanism. These meticulously made safes are manufactured from fire proof reinforced steel sheets that provide enhanced protection to the gun from the elements and also in case there is a natural disaster. Gun owners often opt for a gun safe that is equipped with traditional combination or key locking mechanisms. Both of these mechanisms offer a pretty basic line of defense against unauthorized access or loot. The key based locking mechanism has three basic flaws. The first is a scenario where you are under siege by a home invader and since you don’t keep the keys to the safe near you at all times, therefore searching for the same to gain access to your handgun to ward off the invader is not a feasible alternative. The second scenario involves when the keys to the safe are lost and you have to run to the locksmith to help you open your safe for you. As easy as it sounds, this won’t be the case when the locksmith would bill you for his services rendered. The worst case scenario is what would happen if your child finds the keys to the safe and ends up accidentally discharging a round or two and getting injured as a result of the whole fiasco. The combination locks are a bit complicated to crack and are the best among the analog mechanisms for securing a gun safe. Accidentally changing the combination or forgetting the same while being under pressure would ultimately result in an expensive check from a locksmith. Weighing in on the fact whether the locksmith would be able to retrieve the contents of your safe without damaging the safe itself and the contents is a whole new question altogether. All the above-stated drawbacks of the different forms of locking mechanisms are rendered null and void by the advent and incorporation of the Biometric locking mechanism in the modern day gun safes. The Biometric sensor makes the use of the unique Biometric identity associated with you. The fingerprint reader in the safe transforms each and every fingerprint into a tool or rather a key that is used every time that designated person wants to access the contents of the safe. Since the user’s unique fingerprint cannot be copied, therefore, the safe cannot be accessed by anyone without your physical presence. The fingerprint sensor accesses the database in its memory and opens the door of the safe within moments the user swipes his/her finger on the sensor. The models and makes made available to the users in the market coming from different manufacturers are loaded with different features and specifications. 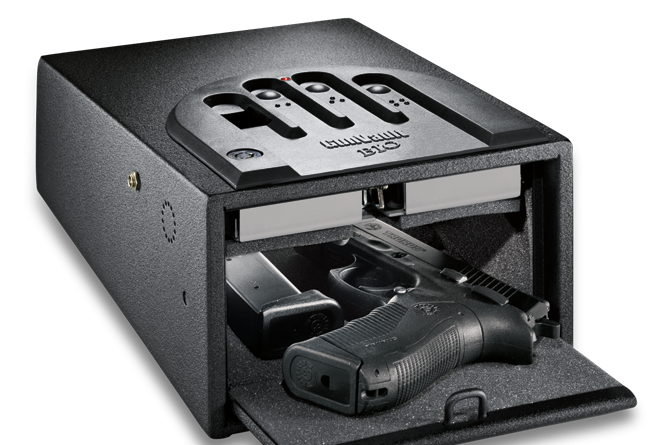 The Biometric gun safe is equipped with onboard memory and processing unit that is used for storing all the biometric data in its raw and digital form. One should always keep this in mind that some Biometric Safes are equipped with sensors that demand precise positioning and swiping of the fingers by the user. The safe won’t be accessible if proper swiping action is not executed. There are also options of safes where the Biometric reader is more adaptable to the different angles of finger swiping action. Biometric safes that can read all the five finger impressions of an individual comes equipped with advanced hardware and amenities, this means that the same would be costing more in terms of price, but will be more secure in the long run. One aspect that one should always keep in mind is that the locking mechanism of all biometric safes are electronically controlled and runs on a source of power like a battery and AC outlet. If there is a case of failure in the source of power, then some advanced biometric safes come equipped with additional methods of opening the same. The sophistication in the techno industry has made it inevitable for the technicians to come up with safety and security measures to ward off fraudulent and unauthorized access to the gun safe. This is making a deep impact on the customer side of operating experience for the biometric gun safe. Maintaining a balance between the ease of operation and the overall complex preventive measures to ward off unauthorized access to the safe is crucial for any gun safe to be successful among the lot available in the market. ← How much does a Gun Safe Weigh?